The ABC series, Flashforward, arguably one of the best written series in a long time, and the best using a science fiction concept, wrestles with a very old idea: what if you knew the future? The show expands it to ask: what if everyone knew the future? And by Episode 3: What if everyone THOUGHT they knew the future? This is not a new concept when you are dealing with people of faith. Christians, specifically, have a vision of the future they hold on to. Actually, they have two. The first one is a concept of Heaven/Hell–that after they die, they will forever be installed in one of two polar extremes: a place of happiness vs. a place of sorrow–both eternal (also known as With God and Without God). After that moment, there will only be a seamless future–one that never changes. This vision of the future does guide their/our actions to certain degree. Some believe, still, that you have to hedge your bets. Do a lot of good things to move your path towards Heaven, or ask forgiveness–quickly–and move yourself away from Hell. This can also guide people’s actions towards you as they try to drag you to one path or the other–most often to Heaven by use of guilt, judgment or restriction. Ah well, the path to Heaven, I guess is paved with good intentions too. But really it’s the other vision of the future that is more worrisome for people of faith. Revelation was a book written based on John’s Flashforward. In that vision he saw lots of stuff–lots of destruction, lots of wrath…it gets ugly. And believers think they may have an escape route–the Rapture. That miraculously they get to escape the major drama of the Earth’s end because they believed. This is not unsubstantiated by the Bible, but it is questionable when it will happen. Trust me, I don’t want to argue pre-post-or mid-millenial tribulation/rapture. And please–don’t discuss it in the comments! What I’d rather discuss is the idea that Christians may be creating the Tribulation themselves–or creating parts of it. In Flashforward we are slowly beginning to believe that the main character, Agent Benford, is actually creating the bulletin-board he saw in his vision not because it has answers but because it was there. In some ways, he may be creating his future, not actually solving the mystery of why everyone blacked out for two minutes. We’ve already seen, in Episode 3, a man get hired to the position of airport security, not based on good qualifications, but because he saw himself in that future, and so did someone else. Many times I’ve watched Christians start to cringe if current events start to resemble events predicted in the Bible: the Anti-christ being a big icon to watch out for, as well as the Mark of the Beast, etc. Credit cards, health cards, any kind of number that identifies you will no doubt bring a lot of fear–and have that implanted in a chip inside your hand or your forehead, and Christians will freak out. (Hopefully lawmakers would NEVER pass an idea like that unless they want great opposition from Christians). I’ve lived through three people who were thought to be the Anti-Christ: Ronald Reagan, Pope John Paul II and now, Barack Obama, for various reasons. Often each one of them had a mystical kabbalistic criteria (their names added up to three sixes as Reagan’s does, or Obama’s “name” was spoken about in the Bible as paired with Lucifer–a complete stretch of the imagination) and a few of them have been “assassinated” and come back to life (Reagan and the Pope). Each time I hear that someone new is the anti-christ, I cringe, thinking that people are gonna start believing all us Christians are loony. And some of them, those that seem to be magnets for the news, deserve that label, not the airtime. But then I wonder how often I too look at events with Revelation in the back of my mind. At what point will events start coinciding so well that there’s a tipping point in even the most casual reader of the Bible–where people start to say–Hey, I’ve seen that before? How often do we reject good things based on a false premise that THIS moment is part of Revelation, when obviously time just keeps rolling on? In Christian circles, we often thank God we don’t know the future–because if we did, it might take away from “who holds the future” and make it Fate, not choice. But maybe that fits more squarely in Christian mythos–that our fates, our destinies, are already written. I don’t think so, myself. Everyone has choices. But if you see a glimpse of your future, you won’t know if it is meant to be, or if you are being given a warning. We ask all the time for God to guide our lives, for us to make good choices, but we fear getting on the road to the wrong destiny. As if the roads are already there and once on them, we’ll go 90 miles an hour. From Cassandra’s ignored warnings to Oedipus fighting against his fate to modern day futurists who tell us what will happen based on world economic events…one of our eyes is always on the future. But will we let our concepts of the future influence today’s actions? Will we allow small evidence to convince us that we are living in “the end times” and then make irrational decisions? Or will we make good decisions based on evidence in front of us and walk knowingly into the future, brave, but watchful, not reacting to everyone who says—the anti-christ is here, the anti-christ is there, etc. What’s probably most disturbing is the Christian concept that they will be persecuted in the End Times. And certainly every time someone critiques a Christian we hear echoes of this “end times” fear resurface. That the critique means that the critic must be an enemy, and that Christians are being targeted. This most resembles “making the future happen.” By letting ourselves be irrational, afraid of debate, sensitive to criticism, and dogmatically judgmental–I think we will create the discrimination and persecution that will probably come. But it happens because we’re being a$holes. I mean, spread negativity long enough, represent bigotry, discrimination and narrow-mindedness long enough and folks will be distrustful. Eventually, yes, being a Christian will be bad publicity. But NOT because the enemy is bad, but because Christians are unloving, paranoid judges. 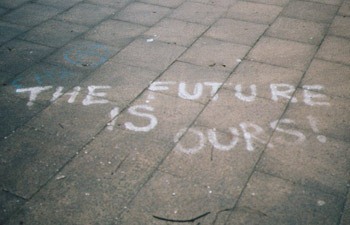 We will create the future we don’t want to happen. Just like Benford is creating in Flashforward. Flashforward is a great show, allowing us to be thankful we DON’T know the future. What a burden. Hopefully it will teach us to treasure the moments we have, without being afraid of what’s coming–and make us watch out not to create the fates we want to avoid. Let’s be good to each other out there. We’re in this world together. Excellent Post! I like this show as well, but I hadn’t thought about the parallel implications from a Christian perspective. While “knowing” the future can make life a little easier by limiting the range of decisions we have to make during the day, we have to be very careful about recognizing the overwhelming amount of things we don’t know. Certainty can lead to arrogance while ambiguity leads to humility.